Konami’s Castlevania series has been around forever. Ask anyone who plays video games about the Castlevania series and they will have memories of at least one of the games in the franchise. They may not be good memories as the games can be frustratingly difficult. While playing the Castlevania games its not uncommon to die over and over again in the same spot. Despite this the games are great (at least I think so). Roughly two years ago I picked up a copy of the “Classic NES” release of the original Castlevania for the Gameboy Advance and it is still to this day sitting in my system (I have two Gameboy advance systems, and switch out the game on the other). If you enjoyed the NES version you will probably love this version. I do and I’ll tell you why. It has a save feature! The original NES version of this game did not include a save feature and I was never able to complete the game. I remember getting very frustrated when this game originally came out on the NES amd after playing the game for hours and hours never being able to defeat Death (the Grim Reaper). Now that I own the Gameboy Advance version I am able to and finally complete the game. Having a save feature in this game is reason enough for me to own this game. Its even better than the Wii Virtual Console version if only for the save feature. 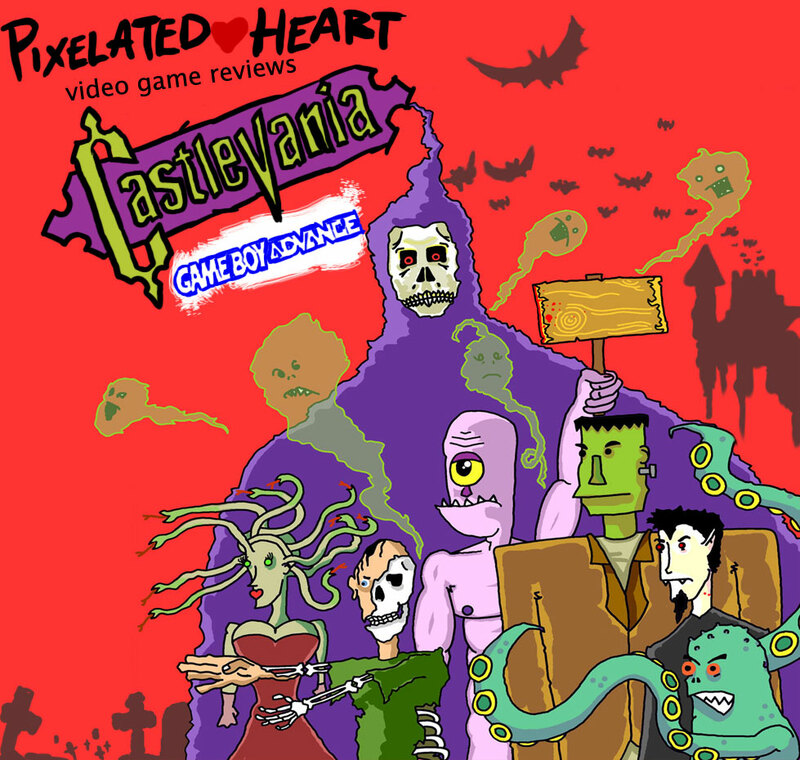 Most people should know the story of Castlevania, but in case a few don’t I will explain it. In Castlevania you play as Simon Belmont. Simon is tasked with destroying Dracula. He must make his way through the castle fighting bats, ravens, skeletons, mer-men, Medusa, zombies, Frankenstein, Mummies, ghosts and a ton of other enemies using just a whip. Well, actually that is a lie. He also has at his disposal multiple weapons that he can pick up along the way. These include holy water, a boomerang, axes, daggers and a few others. The graphics are just as you remember them from the NES days. They are surprisingly crisp on the Gameboy Advance and they have been re-sized to fit the screen (this doesn’t effect game play however). Of course the game can’t touch the visuals of the recent DS or GBA Castlevaina games but it comes pretty close. If youve never played this game I suggest you try to pick it up. I know that my local Gamestop has been running a buy-one-get-one deal on Gameboy Advance games the past week or so (too bad my Gamestop has nothing but crap Gameboy Advance games in stock (maybe thats why they have the special running though)). This is one of the few games that, no matter how aged it becomes will always be a fun game to play.